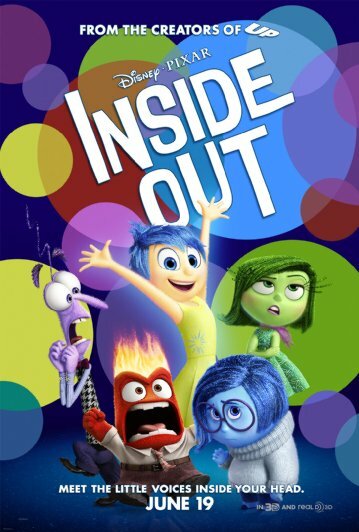 Released: April 17, 2015. Directed by: Levan Gabriadze. Starring: Shelley Hennig, Will Peltz, Moses Storm. Runtime: 1hr., 23 min. Deriving inspiration from such suicides as Audri Pott and Amanda Todd, “Unfriended” uses the internet as a platform for its jump scares. For six high school seniors, life is great – until they join a six-way Skype chat. A year ago today, a high school junior named Laura Barns shot herself on school grounds. The reason: Relentless cyberbullying after an embarrassing video of her was posted online anonymously. On the anniversary, a mysterious force uses Laura’s Skype account to torment the teens. If they sign off, or unfriend her, there will be dire consequences. I’ll say off the bat that the exploitative horror film uses subjects like teen suicide and bullying to portray its premise – which feels insensitive to how many people it affects. But, I understand that horror films exploit so it’s not enough for me to boycott the film. One thing I can’t get past is the lacklustre narrative. The only development the main antagonist gets is that it claims to be Laura’s spirit, and can make those who get tests from the dead commit suicide and reveal secrets. Blaire finds this out when she searches ‘texts from the dead’ online and goes to Unexplained Forums – where all the information is in a tidy little package. The spirit tries to unveil the mystery of who posted the video online, and uses information about them as ammunition to turn them against each other in creative ways. The cast cries and freaks out a lot. The cast is decent for a film that was originally to be made-for-TV – including Jacob Wysocki from “Fat Kid Rules the World” and Will Peltz. Blaire (Shelley Hennig, TV’s “Teen Wolf”) is a rather daft main character who’s convinced that the presence must be one of the people in the chat pulling a wicked prank. The cast, who have to act really anxious, are helped carrying the film considerably by online messages and articles. The film has strong anxiety-heavy sequences and a sporadically unsettling tone, but nothing that terrifies. The slack narrative doesn’t set it apart from other horror features. Its innovative mock Skype interface that’s used for the frame of the film holds a memorable aspect. It’s told in one shot on a computer screen. 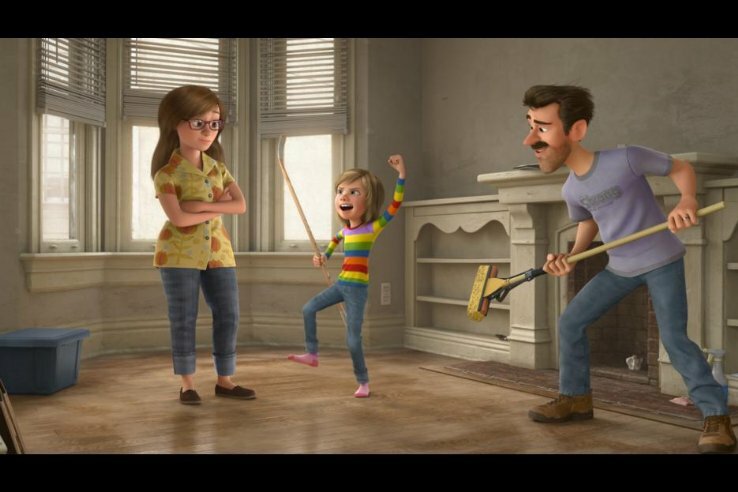 It’s innovative for that reason, but moviegoers can simply watch this from the comfort of their own homes – because the characters never leave theirs. Released: November 20, 2015. Directed by: Billy Ray. Starring: Chiwetel Ejiofor, Julia Roberts, Nicole Kidman. Runtime: 1hr., 51 min. I haven’t seen the original Argentinian film “The Secret in Their Eyes (“El Secreto de sus Ojos”), but the American remake “Secret in Their Eyes” likely doesn’t do it an ounce of justice. The film concerns Jess, portrayed with raw force by Julia Roberts, a police officer whose daughter is brutally murdered in the height of L.A. counter-terrorism following the September 11, 2001 attacks. She seeks justice for her daughter and also wants vengeance from a suspect who was able to walk because of political mumbo jumbo that bogs down the plot to a point of frustration. 13 years later, a close friend Ray (Chiwetel Ejiofor) has tirelessly looked at pictures of convicted criminals all this time. Since he has gone to work for the New York Mets – I assume it’s as the director of security – he is unable to scan the photo into the computer or access face recognition technology. Though, it might have been easier to ask a cop buddy help him out. 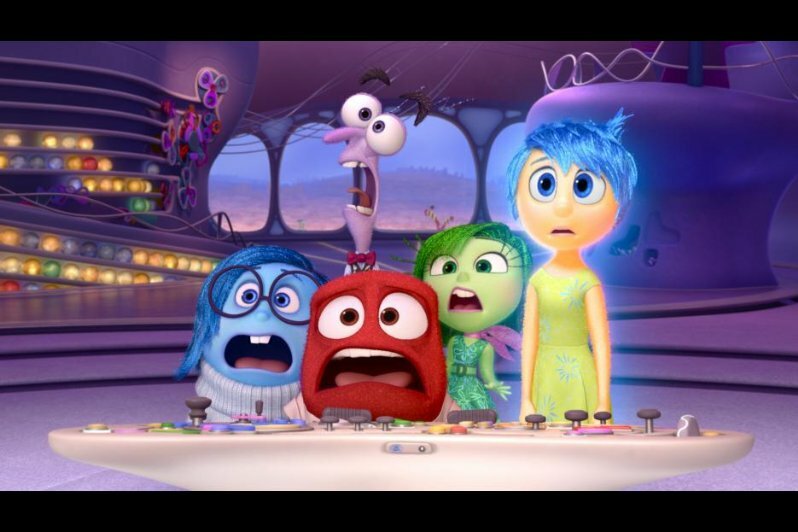 The film is told in a needlessly confusing, non-linear flow where one can only tell the difference of the characters between 2002 and 2015 is that Dean Norris is bald in 2015, Chiwetel Ejiofor just has grey in her hair, and Julia Roberts’ Jess looks like a 50-year-old trapped in a 90-year-old’s body. Seriously: If the point was to convey that this weight of emotional distress or focusing on something you can’t change, brings aggressive aging, they did it well. Kudos, make-up department. As for Nicole Kidman’s Claire, you have to look at her on-screen partner to see if it’s 2002 and 2015. Nicole Kidman doesn’t seem to age… Ever. Also bogging down the plot is melodrama between Ray and Claire’s characters – with the “will they end up together or won’t they” plot line. It seems that this is a main attribute taken from the original. But this melodrama felt out-of-place in something that looked billed as a revenge thriller. It borrows themes from successful revenge stories – notably Denis Villeneuve’s “Prisoners” – but no success is emulated in this only sporadically exciting thriller. Sure, there’s a good set piece at a Dodgers game. And the scene where Jess finds her daughter is heartbreaking. Though: I question if her taking off her gloves and holding her daughter in the dumpster tainted the crime scene. There are good performances here, but they’re just as hatefully written and poorly-crafted characters. While I fully understand Jess’ grief, she is unlikable. She never shows any gratitude to the one man – Ray – who has been trying to find Caroline’s killer and give Jess peace for 13 long years. Seriously, she seems angry with him. When a central character bashes on the only person not purely fighting for themselves – it truly makes it hard to root for justice. P.s., My apologies for the long hiatus there. I’ve been swamped with J-school and other writing so I will try to be more active on here as the month goes along. Released Feb. 27, 2015. Directed by David Gelb. Written by Luke Dawson, Jeremy Slater. 1hr., 23 min. 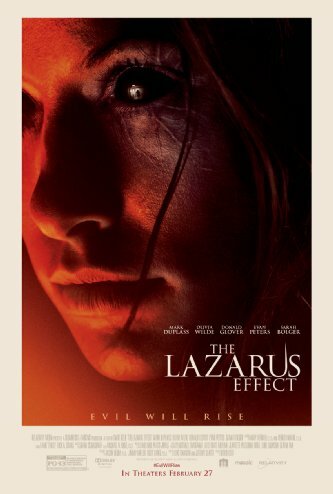 With rushed execution, The Lazarus Effect has a premise taken from Biblical origin that intrigues but an execution and narrative that bores. Zoe, a sometimes creepy Olivia Wilde, and Frank, Mark Duplass, are the head of an experimental scientific team that originally specialized in studying neurological patterns in coma patients. It quickly turned into an experiment where they revive deceased animals just to perfect a formula that could be a revolutionary innovation for healthcare professionals that could give them more time to bring someone back to life. It’s an underground formula where they’re experimenting using a government-approved grant, but they’re not doing what they’re supposed to be. It heightens aggression and make animals display bizarre behaviour when they’ve been brought back. In an extreme situation, they bring Zoe back to life out of Frank’s undying love for her. In its winning horror premise, it’s great on paper. In its execution, it truly doesn’t make a lick of sense. Zoe’s brought back and she starts displaying even stranger behavior than the dogs that have been brought back. She has heightened senses and powers that could be cool enough for a super hero flick – but things quickly go awry. There are ideas of what might lie after death and that’s an interesting aspect of the film, but where Zoe was is only vaguely touched on. The screenplay is predictable in its occurrences and way too rushed for its own good. There are some scenes that are almost good, but way too many that will just leave you scratching your head. The character with the strongest characterization is the central anti-hero, Zoe. She has these horrible memories that constantly haunt her, which adds something remotely interesting to the narrative. Something silly in the film is the utilization of an opera song that is meant to instil fear and anxiety in viewers, but just ends up being quite laughable. The film just isn’t scary in the traditional sense, but is alright at building tension. It’s just far too quickly forgettable for its strong cast also including Donald Glover and Evan Peters, playing far too basic characters. Sarah Bolger’s performance is mildly enjoyable, though, and Olivia Wilde a bit too unconvincing. One good thing that came out of the project is the fact that it at least isn’t filmed in found footage. There is a documenter present, character Eva portrayed by Sarah Bolger, and since the premise did seem promising enough; it was able to get enough funding to warrant a strong production quality. For a demonic flick, it’s one of the more creative premises to come out of the sub-genre, but the god-awful execution can’t save it. Released March 13, 2015. Directed by Jaume Collet-Serra. Starring Liam Neeson, Ed Harris, Joel Kinnaman. Written by Brad Ingelsby. 1hr., 54 min. 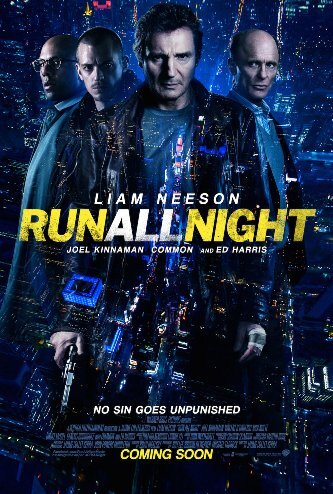 Featuring a visually pleasing style and packing a surprisingly emotional punch, Run All Night will please anyone looking for a concise narrative that happens over one long night. Fate pits best friends Jimmy Conlon, portrayed by Liam Neeson, and Shawn Maguire, Ed Harris, against each other in a deadly situation when Jimmy is forced to kill Shawn’s son to protect his own kin. Maguire’s son Danny, the up-and-coming supporting star Boyd Holbrook (A Walk Among the Tombstones), kills a pair of Albanians in a local gang after he tries to bring drugs to the family business. The entire situation is a product of Danny’s insolence and need for independence – to handle a problem on his own, like his father suggested. Surely, this is not what he meant. His father is a legitimate business man, also known as a New York mafia boss, who won’t bring drugs back to his city after he had a bad experience amongst his workers once before. Michael, portrayed by RoboCop’s Joel Kinnaman, comes into this when he drove the to-be-murdered Albanians to Danny’s home. He is a limousine driver and family man, with a seriously estranged relationship with his own father – a former hitman for Shawn Maguire. Now Jimmy is retired, but his nightmares of those he has killed have not rested. He’s drunk and tattered, playing the flawed hero he seems to play at least once a year nowadays, notably in 2014’s Non-Stop and A Walk Among the Tombstones. Hey, if it works, it works. It feels even more familiar here, however, since this has such a similar style to Non-Stop, which director Jaume Collet-Serra also helmed. It has a different framing – New York circa Christmas time, but it’s about as much of a Christmas flick as Die Hard. There’s also a prominent NHL game in play throughout – the New York Rangers versus the New Jersey Devils, perhaps to display the city’s culture. It later works cleverly into the screenplay, which is written by Brad Ingelsby, writer of 2013’s Out of the Furnace. Similar settings, scenes and tone make this more familiar. Run All Night isn’t memorable because of its originality, but because of its emotionally interesting narrative. Jimmy will largely do anything to protect Michael and that shows a father’s love for his son, even if they don’t know each other well. However, Michael’s bitterness towards his father becomes so sporadically extreme, that the character is sometimes too unlikable. During the quicker action scenes, the editing becomes hectic. That’s one of the weaker technical aspects of the film; but the redeeming cinematography is smooth. The action scenes work because they are fun and have personality. But there are scenes that don’t work – like uninspired bouts of ruthlessness just so it can show that these characters can be brutal. Or a bathroom brawl for lack of realism, since they make a lot of noise – and how does no one hear the commotion in the commode in a crowded subway station? 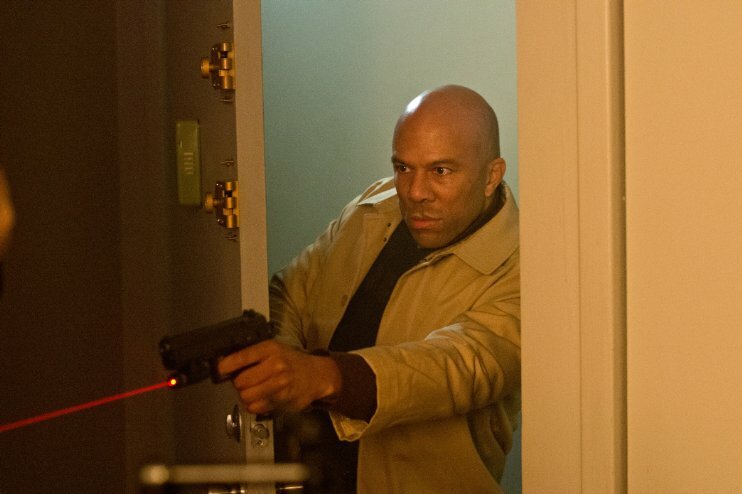 A fun antagonist includes a hitman portrayed the Oscar-winning Common. He’s called to be robotic and calculated as Andrew Price, but ends up being the Dr. Jekyll and Mr. Hyde of assassins, particularly when he’s called to put on his nice guy act, and then he becomes monstrous. Vincent D’Onofrio portrays Detective Harding, an antagonizing, prejudiced officer who has been gunning for Jimmy “Gravedigger” Conlon for years. His assumptions of Jimmy and his son are sometimes downright mean. 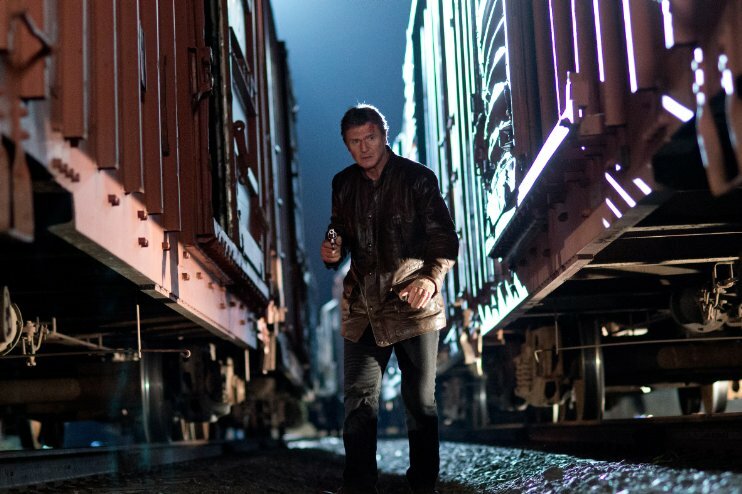 Director Jaume Collet-Serra does bring his best action film yet to the table. He expertly deals with themes of regrets in life through Conlon, largely signified through a repeated line with former bestie Maguire, “Wherever we’re going, when we cross that line, we’re going together.” It’s fascinating that a family member’s death because of intense circumstances can cause him to be so vengeful, but the way that writer Ingelsby doesn’t delve into it well enough causes him to be more basic than he could have been. Collet-Serra handles the emotions well and builds great tension throughout.